Chanel has been my main source of inspiration when it comes to make-up: Elegant and feminine but also confident and proud. Their Illusion D'Ombre Ad was no exception. 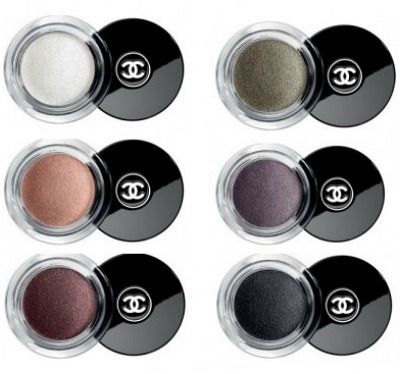 I really wished to run to Chanel to purchase this eyeshadow but it costed $67ish in Korea so I had to wait until I come back. I went to Chanel in Mississauga and tried each of the Illusion D'Ombre. I was going to purchase Illusoire (purple) but I ended up purchasing Epatant (khaki) instead. A small brush was also in the box... what a pleasant surprise! I was very surprised with the size of this jumbo-sized eyeshadow. It costed twice as much as MAC eyeshadows but I obviously wasn't expecting much. However, this babe is huuuuuuuge. Now, my first impression of this eyeshadow was that it looks grainy. It looked like handful of sand packed in pot. However, the product feels like JELL-O pudding in metallic version. It is very creamy and high-quality. I had no choice but to enlarge these photos so that you can really feel the texture of this eyeshadow. These photos tell that it is not grainy, but rather, jell-o-like. Also shimmery and metallic, it hardens a bit so that it does not smudge all over the place. Yes, this look came out after using ONE eyeshadow....yes, only ONE eyeshadow. Metallic eyeshadows really capture surrounding lights and makes the inner corners bright, giving that nice contrast with outer part of the eye. I wore it shear so that it works for everyday look but I was advised to pack it on your eyelids, so we have options to choose from. FYI, it lasted all day and gave absolutely no irritation whatsoever. After trying it out, I decided to purchase Illusoire in the near future. That's it for the review :) Thank you and stay tuned for my upcoming MAC eyeshadow reviews!